I study political violence and the transnational dynamics of civil war in the Middle East. My dissertation focuses on the Syrian opposition-in-exile, exploring how a complex network of activists, journalists, aid workers, diplomats, administrators, and militants comes together to build political order in the opposition-held territories of Syria. To that end I spent twenty-six months conducting fieldwork between Amman, Jordan and Gaziantep, Turkey, collecting interviews with opposition figures about the opportunities and challenges posed by mobilizing politically from exile. Civil Wars & Political Violence; Transnational Political Activity; Popular Geopolitics. 2nd Place, California Geographical Society Graduate Student Talk Award, 2013. Foreign Languages and Area Studies Award (Advanced Arabic), Summer 2014. Graduate Summer Research Mentorship, Summer 2014. Alice Belkin Memorial Scholarship, 2013-2014. Graduate Research Mentorship, Academic Year 2014-2015. Distinguished TA Award (Department of Geography), Academic Year 2013-2014. Ph.D. Geography, University of California - Los Angeles (ongoing). Loong, S., Sidaway, J.D., Woon, C.Y., Agnew, J., Alff, H., Fluri, J., Hamdan, A., Jones, R., Krichker, D. & N. Megoran. (forthcoming), “Reading Nick Megoran’s Nationalism in Central Asia: A Biography of the Uzbekistan and Kyrgyzstan Boundary.” Political Geography. Click here for access. Hamdan, A.N. (2018). “Research Note: War, Place, and the Transnational." Mashriq & Mahjar 5 (1), 127-131. Click here for access. Hamdan, A.N. (2017). “Sites of Memory in Lebanon: The Hariri Mosque in Downtown Beirut.” In Nikro & Hegasy (eds), The Social Life of Memory: Violence, Trauma, and Testimony in Lebanon and Morocco. Palgrave-MacMillan. Click here for access. Hamdan, A.N. (2017). “Toward a Vocabulary for Syria’s Opposition.” Jadaliyya. Available here. Gleason, C.J. & A.N. Hamdan (2017). "Crossing the (Watershed) Divide: Satellite Data and the Changing Politics of International River Basins." The Geographical Journal 183 (1), 2-15. Click here for access. Hamdan, A.N. (2017). “Thoughts from the Provinces.” International Journal of Middle East Studies 49 (2), 331-334. Click here for access. Hamdan, A.N. (2017). “Stretched Thin: Geographies of Syria’s Opposition in Exile.” POMEPS Studies 25, 32-36. Accessible here and here. Hamdan, A.N. (2016). "The Displaced as Actors in Syrian Politics." For the Middle East Institute, click here for access. Hamdan, A.N. (2016). “Breaker of Barriers? Notes on the Geopolitics of the Islamic State in Iraq and Sham.” Geopolitics 21 (3), 605-627. Click here for access. Hamdan, A.N. (2016). Review: Leisurely Islam: Negotiating Geography and Morality in Shi’ite South Beirut, by Lara Deeb and Mona Harb (Princeton, NJ: Princeton University Press, 2013). Arab Studies Journal XXIII (Vol. 2), 315-319. Click here for reference. Hamdan, A.N. (2016). “On Failing to ‘Get it Together’: Syria’s Opposition between Realism and Idealism.” Middle East Report 277, 28-34. Click here for access. Hamdan, A.N. (2015). Review: The Hizbullah Phenomenon: Politics and Communication, by Dina Matar, Lina Khatib, and Atef Alshaer (New York, NY: Hurst & Oxford University Press, 2014). Sociology of Islam 03 (3-4), 212-215. Click here for access. Hamdan, A.N. (2013). “Where’s the State? Practicing the Past in Beirut, Lebanon.” MA Thesis, University of California, Los Angeles. Hamdan, A.N. "Review: Burning Country: Syrians in Revolution and War" by Robin Yassin-Kassab and Leila al-Shami. For Arab World Geographer. Hamdan, A.N. “To the Inside: Distant Politics in Syria's Civil War." For Annals of the Association of American Geographers. Hamdan, A.N. "The Opposition's Three Territories." For book project, Exploring Syria's Borders & Boundaries, 1920-2016. Hamdan, A.N. "Violence with Prepositions: Geographies of Conflict." 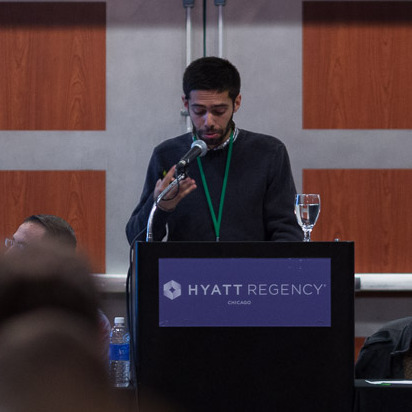 AAG Annual Meeting, 2015 (Chicago). Middle East Studies Association (MESA) Annual Meeting, November 23, 2014 (Washington, D.C.). Center for Middle East Studies (University of Arizona) Graduate Conference, April 10-12, 2014. Center for Islamic Studies (University of California, Santa Barbara) Graduate Conference, April 4-6, 2014.